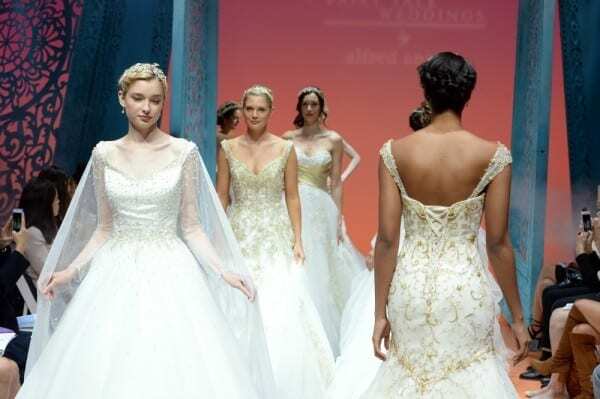 I don’t post much about weddings and wedding gowns here, but when we’re talking about wedding gowns + Disney, I knew I had to share these with you. To kick off New York Fashion Week, bridal designer and retailer Alfred Angelo debuted the 2016 Disney Fairy Tale Weddings collection. 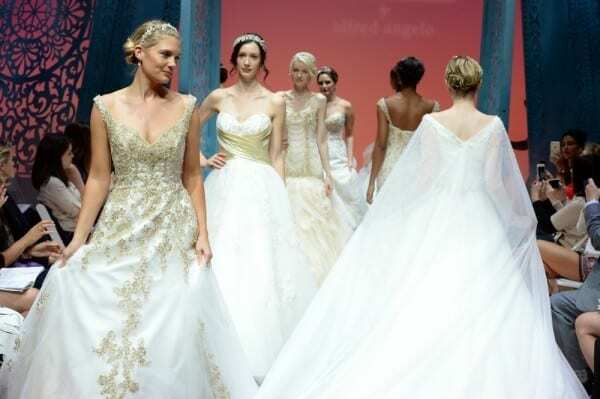 A bride wants to sparkle and shimmer and she will with the on-trend shimmering metallic embellishments. Enjoy these timeless gowns, that epitomize the strength and inner glow of each unique Disney princess. Ariel – Style 263 With its flowing lines and imaginative touches, this gown evokes the free spirit of the unconventional princess of the sea. The dropped waistline bodice is dramatically adorned with metallic embroidery, crystal and metallic beading, rhinestones and pearls to sparkle like light on water. The diaphanous organza skirt has been fully embroidered with romantic flange ruffles to move as gracefully as waves of the ocean. The gown is finished with a chapel length train. Adventurous and graceful, the flowing lines evoke a sense of free, natural beauty and grace. Aurora / Sleeping Beauty – Style 260 Soft, stylish and graceful, this organza gown floats as if in a dream. With a delicate sheer tulle yoke adorned with pearls, rhinestones and delicate hand-made flowers that sparkle like love in bloom. 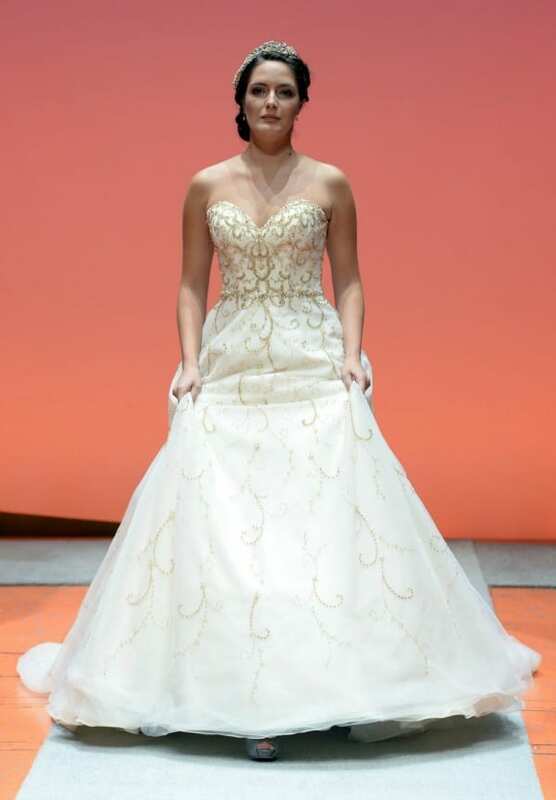 The fitted bodice is accented at the natural waist with a pleated cummerbund, flowers, and sparkling beading. 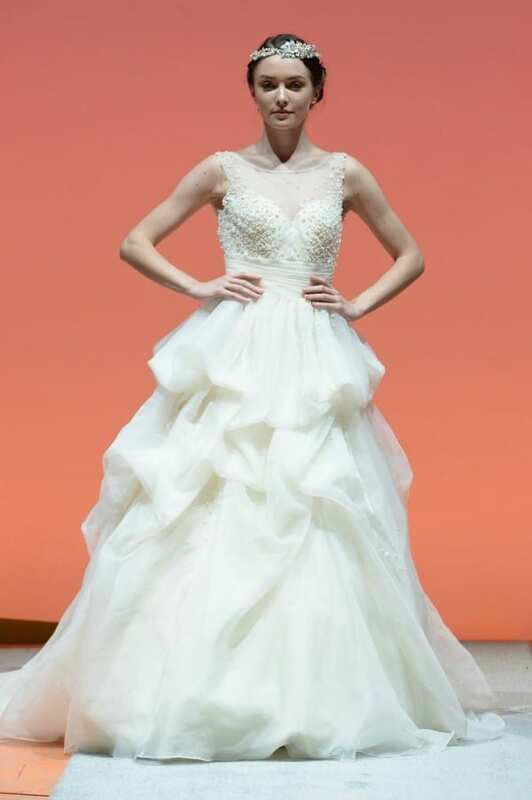 A full pick-up skirt of voluminous organza is accented with dazzling beading and floats gracefully down into a chapel length train. Belle – Style 254 This quintessential fairy tale gown of tulle and glitter net features a strapless dropped waist bodice fully adorned with metallic embroidered lace. 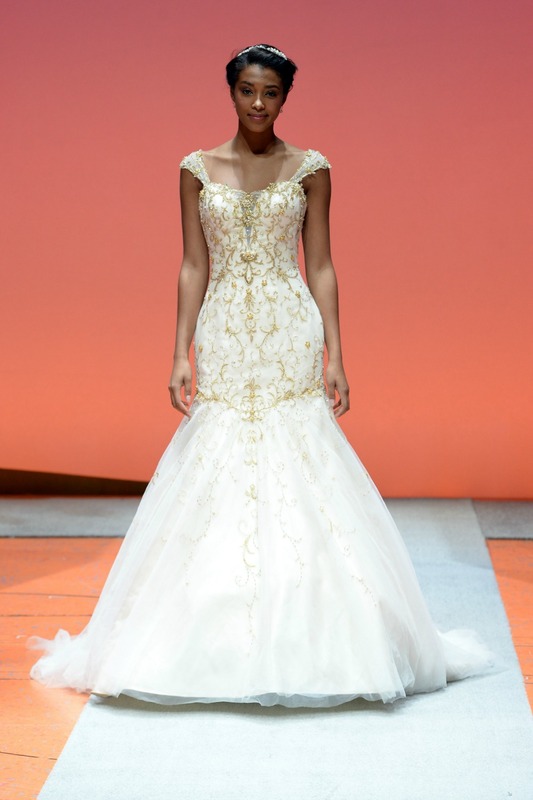 The neckline and waistline are lavishly beaded with pearls, crystals, metallic beading and rhinestones. The beautifully draped skirt glitters all around and is accented with delicately beaded lace applique down through the chapel length train. The look is luxurious, sophisticated and perfect for the bride who wants to feel like royalty on her special day. Cinderella – Style 262 Timeless beauty rules in this classic strapless tulle and glitter net overlay gown. 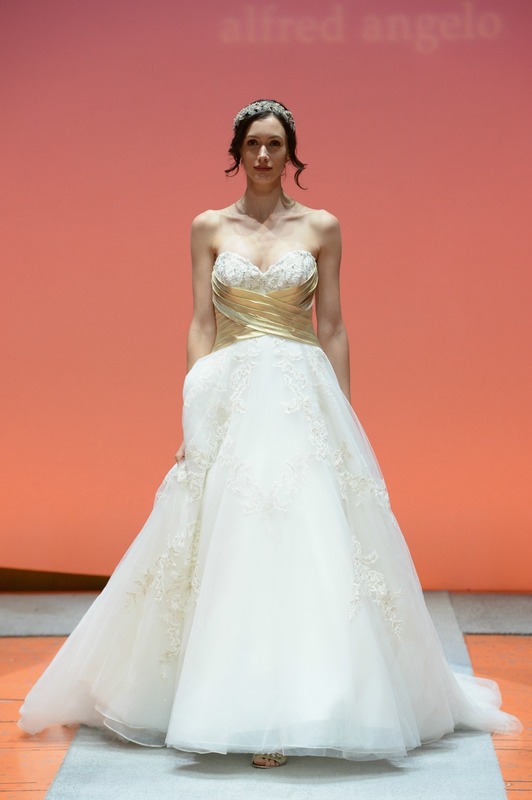 The entire gown is dramatically decorated with metallic embroidery and dazzling crystal and metallic beading and is subtly accented at the natural waistline with pearls, rhinestones, and crystals. Finished with a chapel length train, the gown is the perfect statement for a bride who wants her wedding to be both romantic and regal. Elsa – Style 258 Sophisticated lines and sparkling touches create a look that is both ethereal and dramatic. The beautifully draped gown of satin and tulle features a fitted bodice, tip-of-the-shoulder straps and full length sheer tulle sleeves. The bodice and sleeves are jeweled with crystal and metallic beading, rhinestones, and sequins to glisten like ice and snow. The gown is finished with a chapel length Watteau train for a look as strong and beautiful as the princess who inspired it. Jasmine – Style 261 With its bold silhouette, this strapless tulle and glitter net gown with a dropped waistline is perfectly sophisticated, capturing the spirit of the princess who inspired it. With a softly rounded sweetheart neckline that has been elaborately adorned with metallic embroidery, and sparkling crystal and metallic beading, this gown is reminiscent of starlit nights in Agrabah. 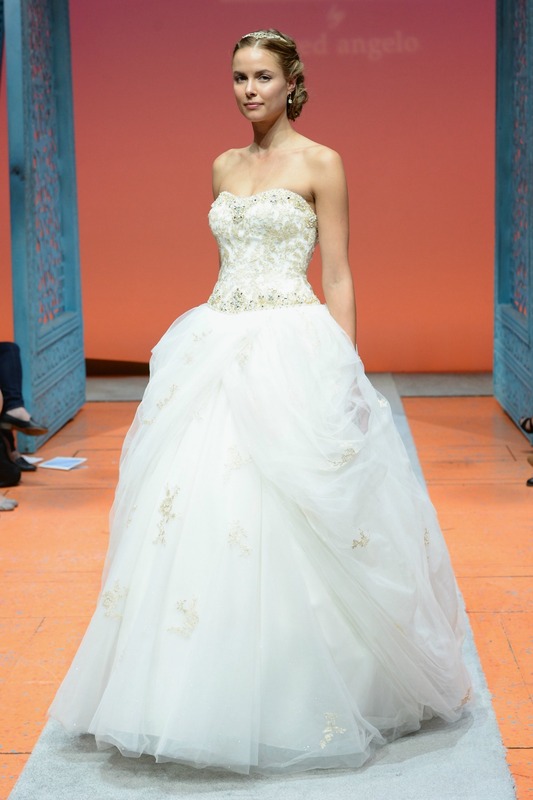 The skirt is softly draped to match the bodice while the gown finishes with a chapel length train making the dress as exotic and beautiful as Jasmine herself. Rapunzel – Style 255 Romance blooms in this soft A-line gown featuring diaphanous layers of tulle and shimmer tulle dramatically adorned throughout with trailing tendrils of delicately beaded lace. Narrow shoulder straps and a sweetheart neckline accented with elaborate crystal and metallic beading add a touch of unconventional whimsy. The full sweeping skirt features soft floral godets and is finished with a chapel length train for a look as ethereal and dreamy as her perfect day. Snow White – Style 256 Fairy tale elegance and delicate femininity come together in this strapless tulle and glitter net gown that celebrates natural beauty. The fitted bodice is embellished with floral re-embroidered lace accented with crystal beading and pearls. A pleated cummerbund at the waistline adds understated flair while the full princess ball gown skirt features layers of gossamer tulle and glitter net accented with floral swags of matching re-embroidered lace. The gown is finished with a chapel length train. Tiana – Style 253 Evoking the exuberance of the 1920s and the spirit of New Orleans, this trumpet gown is lavishly embroidered and accented with glittering crystals on tulle. 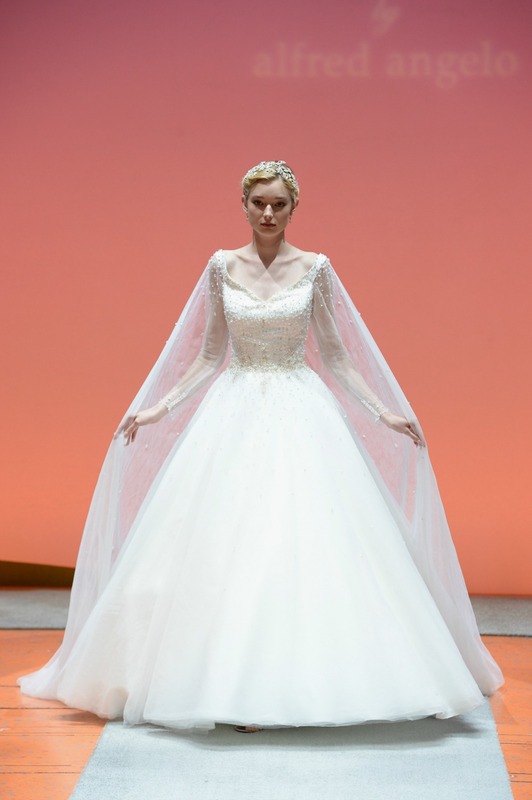 The sweetheart neckline is accentuated with sheer illusion and delicate cap sleeves. The gown is finished with a chapel length train. As soft and sultry as jazz music, this romantic yet modern gown epitomizes princess glamour. Here are a few of the bridesmaid gowns, called Disney Maidens. 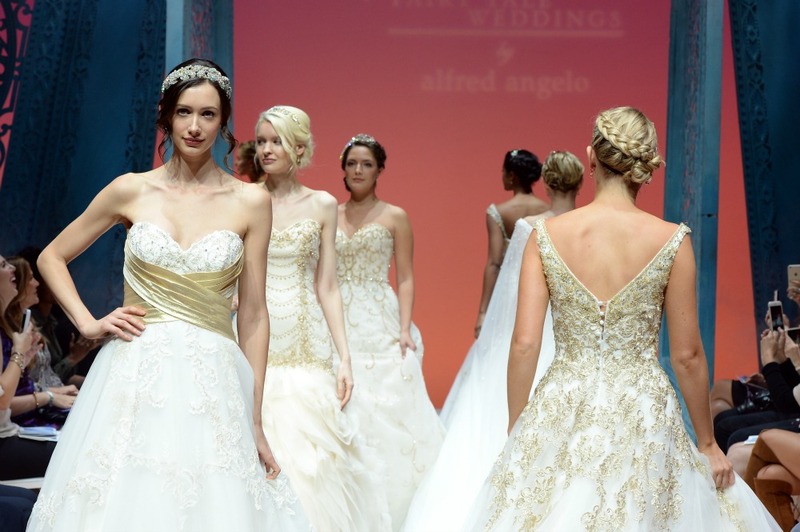 The 2016 Disney Fairy Tale Weddings bridal collection by Alfred Angelo will be available in January 2016 at Alfred Angelo Signature stores in the U.S. and specialty retailers worldwide. 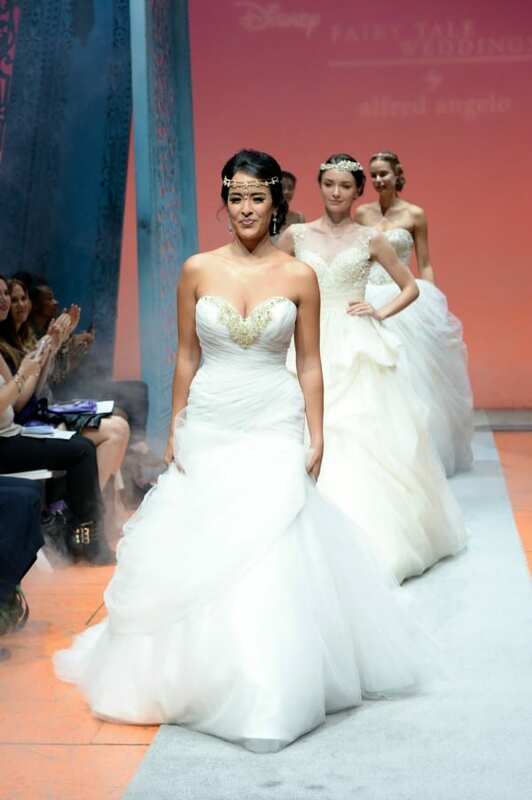 Gowns start at $1,249 (USD). For those of you like me who want a peek into the show, here’s a must watch video. Enjoy a few group shots of the lovely ladies and their gorgeous Disney Fairy Tale Weddings Collection.